Pipes are a vital part of every building. Whether it’s your home or office, pipes provide water and help to heat and cool your environment. Most people may not think about it very often, but luckily there are innovators who are continuing to improve on this ancient technology. One such example is Aquatherm, the sustainable piping company. If you’ve ever had a pipe fail, you know how much of a hassle that can be. Not only will failed pipes result in water leaks and damage, but they are also difficult and costly to repair. That is why Aquatherm works to make quality pipes that do not fail. And they do this while making the lowest environmental impact possible. Aquatherm’s pipes and fittings are made from polypropylene (PP), which is one of the longest lasting piping materials in the world. Their expertise in piping has made them the world leader in PP piping systems for potable, hydronic, and greywater applications. They’ve even branched out into brewing, completely changing the way microbreweries are piped. We had the chance to speak with Aquatherm Chief Technology Officer Jim Paschal, P.E., LEED AP to learn more about their sustainability strategies and practices. Innovation and Tech Today: What extra steps were required for your company to “walk the green talk”? Jim Paschal: You must be better than you were the year before, year after year. You must keep proving you’re getting better in these different areas. Energy management, environmental management, that type of thing. And, along those lines, there was some paperwork certainly involved in getting Aquatherm’s Environmental Product Declaration (EPD) and Life-Cycle Assessment (LCA) certifications, but there’s also a lot of work internally in terms of setting up processes, evaluating things like your source of materials, and evaluating your material suppliers: Are they also accredited? What sort of sustainability features do they have? Getting those approvals was certainly an end result in terms of that first step. But it did require a lot of internal work in terms of reevaluating how we were doing business, how we were manufacturing the products, and who we were sourcing our materials from. And that’s just the internal piece. Externally we focused a lot on applications where our product lines are really intended to help with the overall building efficiency in terms of the construction industry and building construction. We focused on improving efficiency and improving how that building is going to operate long-term, and the life cycle costs of operating that building. So, a lot of internal things went into these accreditations but then, externally, we’re really focusing our product lines along those same, environmentally friendly, sustainable building construction, design guidelines. So, it’s driving pretty much everything across the company, internally as well as our marketing and sales. Everything we do, is focused in that area. I think certainly, and this goes back a few years, but certainly one of the big things was that process of evaluating our material suppliers and our sources for different ingredients. We fully focus now on as much local sourcing for not only manpower and design work and machine/tool building, that kind of thing, but also as much as we can on those suppliers. We are reducing the overall impact of what we’re bringing into the plant before making the product. I&T Today: What kind of materials do you use to make your product more sustainable than your competitors’? JP: I can’t get into too much detail, because we do have a proprietary formulation across all our product lines. But we do ensure that all ingredients line up with those formulations and that they are environmentally friendly. We certainly promote our products as being non-toxic, whether it’s drinking water, food contact, medical grade plastics, or pharmaceutical applications. So, for example, rather than having a generic polypropylene material that might be used in a lot of different applications, where you can go to any industrial supply and buy some polypropylene tubing, ours are specifically formulated for the heating and cooling side of the business and the plumbing side of the business and those markets that we’re specifically in. At the macro level, it comes back to the idea that we introduced polypropylene in the North American market for the building and HVAC construction trade because prior to that, it wasn’t there. And then the fact that polypropylene is a lot more environmentally friendly than the metal piping systems that we’re competing against which is all kind of flushed out by the LCA and the EPD. These documents are what allow Aquatherm to contribute to points in the U.S. Green Building Council’s Leadership in Energy and Environmental Design (LEED) v4 program. We are the only piping system in North America with this designation. At the big level, that’s probably one of the most important things to understand. I&T Today: What insights do you gain from your life cycle assessment? JP: There were a couple of things that we were surprised at in terms of some of the energy demand categories and some of our additives were really creating much higher numbers for us than we really expected them to. And we’ve gone back and looked at some of those additives to see whether there are other options that we could use that are not quite as detrimental in terms of the overall numbers. We’ve also looked at the energy demand requirements within our own material formulation. So, that was surprising. That’s caused us to go back and revisit some of the additives. There were other factors that we really did not have a good handle on in terms of a full life cycle assessment. The first step was to the cradle to gate. So essentially our manufacturing and distribution process. We then started looking at cradle-to-grave and found that we were having a very difficult time getting the information we need to properly assess what’s happening to the material after it leaves the manufacturer, gets installed, and then later in the lifetime of the product. That was one area where we thought we’d be able to get more information. We thought that information would be much more readily available than it has been. We are still working toward that. The other piece of that was surprising, in terms of the magnitude, was the effect the brass material used in some of our fittings had on the analysis. We have brass inserts where we make a threaded connection to another material, say copper or steel, which we consider our competitor products in the market. And just a small portion of brass that we used in these fittings compared to the very large volume of overall product going out the door, also was a very significant impact in terms of the LCA. So, we are looking at some other ways to use different materials in those threaded fittings that will eliminate the brass entirely from the product line. This could significantly reduce the impact that the metal portion of the fittings was having on our overall product line assessment. I&T Today: What are some other challenges when it comes to making the business model more sustainable? JP: We need to look at this in terms of both internal and external challenges. Internally, keeping it sustainable. I think the most challenging aspect is ensuring you have buy-in from all the employees across the company. Whether it’s on the sales side or manufacturing, operations, it doesn’t matter. Everybody must be focused for it to work properly and also maintain your competitive edge. So, you can certainly do all sorts of certifications and record-keeping and things like that and drive up your internal cost. But that’s not the point of this. The point of this is to make your processes more efficient and in doing so, actually lower in many cases, your internal cost. But that requires buy-in from everybody. Continuing to do that and continuing to get that buy-in and continual improvement is a very strong focus internally for the company. Externally, in terms of the business model, we are very active in a number of organizations that promote the use of all of our systems which directly relate to the concept of using water for heating and cooling as opposed to air. Water is much more efficient, at least ten times more efficient in some cases. It’s just a much better way to move energy around instead of forcing air around the building. And so, everything we’re doing is being driven by selling products into that market. We want engineers specifying radiant heating and cooling as their design of choice rather than forced air and we see a lot more of that now occurring in North America, which is a great development for everyone. That’s really where our focus is. But that’s a big departure in North America. Most engineers, construction, building design engineers, have not been trained that way. Radiant heating and cooling is now gaining a lot of momentum in North America and I think part of that is because our energy is not as cheap as it has been historically. We’ve had the luxury of very cheap energy compared to the rest of the world. And so, we haven’t had to focus on that as much. But now we are, and I’m seeing a lot more of that in the industry and that’s really what we’re trying to promote as well. We are constantly meeting with contractors, engineers, and building owners just promoting our overall concept of using water for heating and cooling as opposed to forced air. I&T Today: What else is new? What else is on the horizon for your industry, do you think? In terms of changes like these in technology or in, let’s say your operations. JP: I think in terms of the industry, we’re seeing a lot of new radiant heating and cooling technology coming out. There are a lot of different ways to achieve that. Chilled beams, for example, and other technologies that allow you to heat and cool the living space without blowing air around. If you go to industry trade shows, you can see an entire exhibit hall filled with new technology for different ways to do that. But it all comes back to that same concept of using water to move energy from one place to the other and heat and cool the building. That’s where we fit in. Our products, our system designs, and the materials are formulated for this application. Historically, other materials such as copper and steel have been used for heating and cooling, and it is imperative to ensure that our highly-engineered piping systems are robust and that the installers putting the systems in are properly trained. So, there are some challenges and from our perspective, that’s where we really excel. We strive to provide the right material, the right product line, and the right support for everyone involved. I&T Today: Is there anything you would like to add? JP: I did want to reiterate that when it comes to sustainability and piping systems, Aquatherm has really set a high standard with our effort to get the EPD and in turn to be able to directly contribute to LEED v4 points. We’re the only piping system in North America to have obtained a type III product-specific, independently verified, EPD. 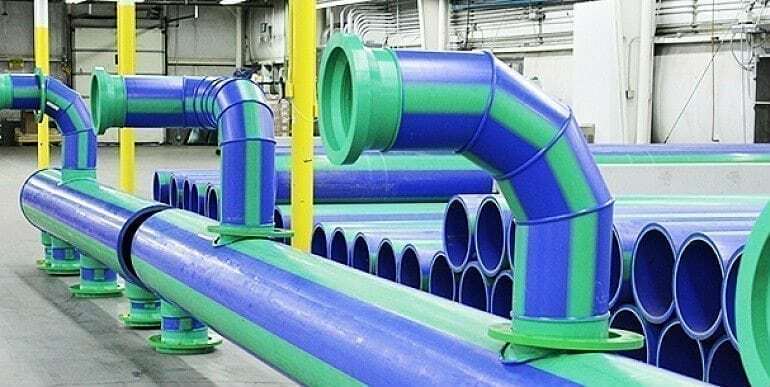 It was developed in compliance with international environmental management guidelines (ISO 14025) and benchmarks the impacts of Aquatherm Green Pipe®, Aquatherm Blue Pipe®, Aquatherm Lilac Pipe®, Aquatherm Red Pipe®, and Aquatherm Black System®. It was independently audited and certified.